Pattern-related embroidery always relates to a weave pattern. 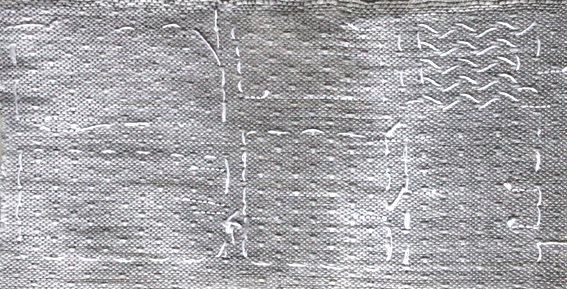 A better known technique might be embroidery on waffle weave which relates to the pattern of waffle weave. Another example is huckaback darning (or Swedish weaving) that relates to the pattern of huckaback. Pattern-related embroidery relates in general to weave patterns. It comprises of building structures together with a weave structure. 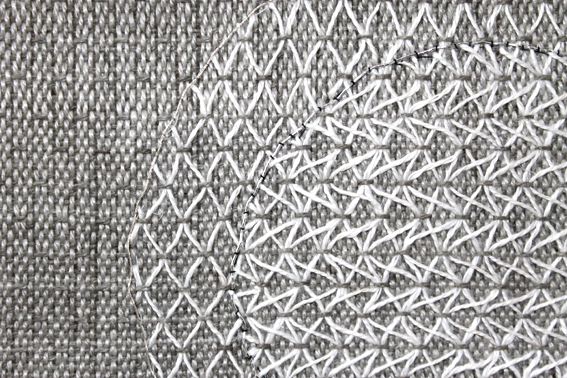 Pattern-connected embroidery can be done by darning and/or stitching. There is no counting of single threads. 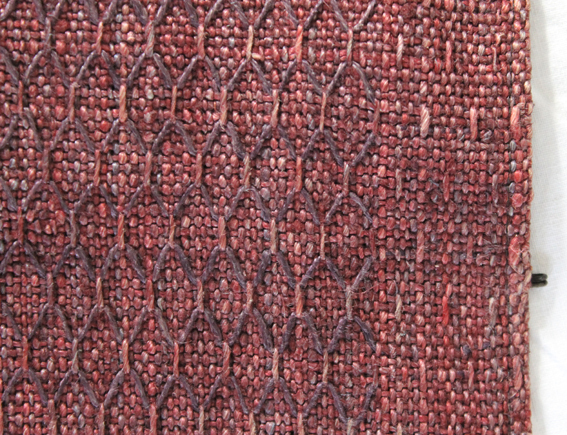 The stitches follow the weave pattern. They cooperate with the weaved threads. 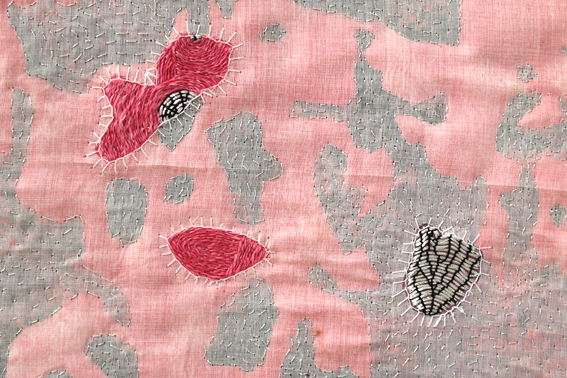 ROSEFINCH 2 - this detail shows pattern-related embroidery. 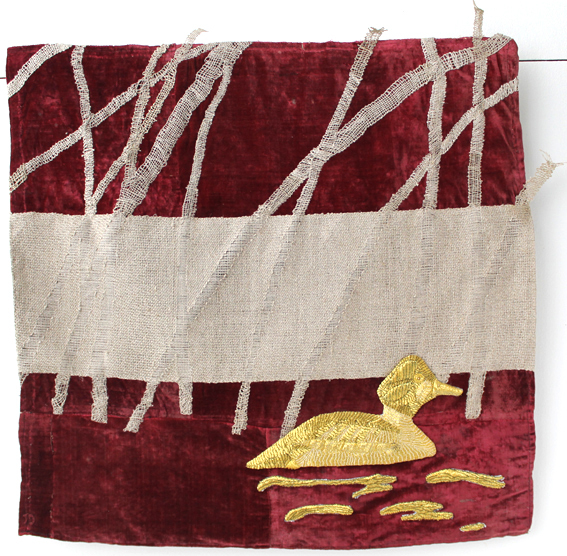 The embroidery relates to the weft floats of the weave pattern. To relate embroidery to a weave pattern by chance could have happened from time to time in history. But unfortunately not very much is known about this method. As a pupil in Magdeburg I learned pattern-related embroidery, as it was developed in several clerical workshops belonging to the protestant church. The technique was developed after World War I and then continued until 1989. Those particular workshops were run by deaconesses. In the beginning of that period the workshops co-operated with each other. They taught different techniques and exchanged experts. In the 1920�s Germany was still shaken by war. This caused a rethinking in the protestant church. One focused on the essence of belief and life. 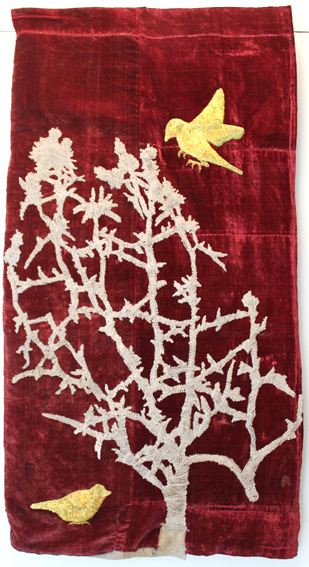 A back-to-the-roots movement started and caused a reformation of clerical textiles as well. Before that reformation textiles in churches were made as glorious and exclusive as possible. After that they were made with natural material. In the beginning all material was linen. 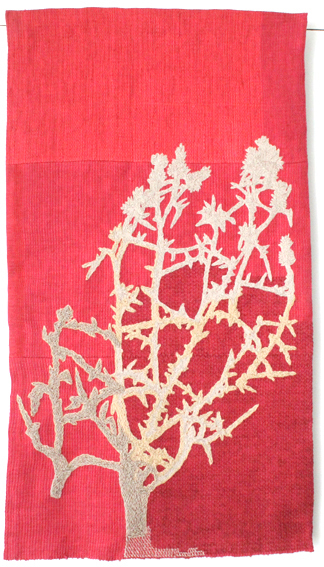 They were completely be made by hand � hand spun, hand woven, dyed naturally and hand embroidered in a more modest way. The intention to make a difference was understandable but something was missing. As it often happens in life: You want to make something in a new way but what you achieve is the opposite. Something important can get lost. When the first works of the new stile were ordered from the clerical workshops World War II had almost started. Detail of an altar frontal from Recknitz/Mecklenburg. The cloth is weaved by hand with handspun linen thread by an unknown weaver. The weave pattern shows warp floats on the right side and weft floats on the reverse. 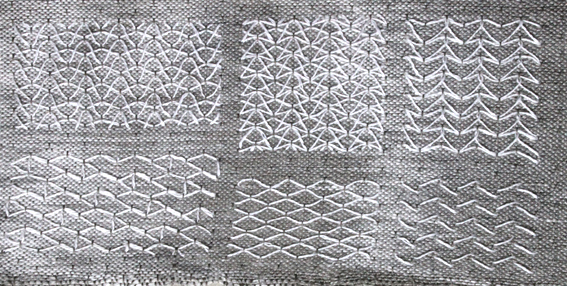 The pattern-related embroidery connects to warp floats. The embroidery was done in 1940 by Minna Otto who was running a clerical textile workshop at Stift Bethlehem in Ludwigslust/ Mecklenburg. For ROSEFINCH 2 I made this sample with the same weave pattern as in the Recknitz frontal. 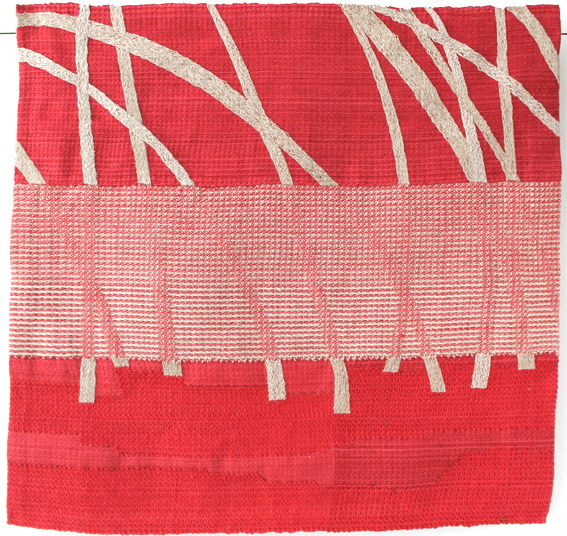 I tested different embroidered structures in relation to the weft floats. The reverse shows that most of the embroidered threads are only on the right side.